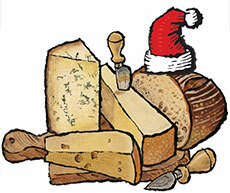 Holiday Cheese Course for sale. Buy online at Zingerman's Mail Order. Gourmet Gifts. Food Gifts. Cheese party in a box. We'll hand cut and wrap three of our top selling cheeses the day they ship to you: Pleasant Ridge Reserve, Bayley Hazen Blue, and L'Amuse Gouda. We'll also stash some spiced pecans and a loaf of Sourdough Bread along with it. About a pound and a half of cheese, it'll serve twelve for appetizers or after dinner—or maybe a bit of both. Handpacked in our cartoon gift box. We also have great American slate and Italian olive wood serving boards.